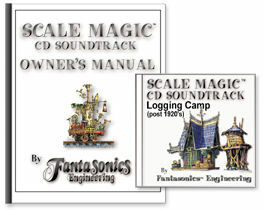 This CD soundtrack will create the ambiance for most any early logging scene you have modeled. The logging is the foreground in this scene. The loggers are busy felling trees with axes and two-man-saws, and a vertical boiler & donkey engine are working the winches. The entire scene is set in a Scale Magic mountain forest ambiance. Includes both day and nighttime scratch built tracks... lumber jacks "saw logs" at night, too!